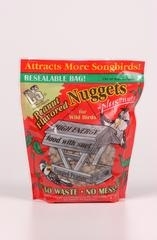 Rendered beef suet, peanuts, corn and raisins can be fed alone on a platform feeder or Nugget/Peanut feeder. Ideal when mixed with 5-10 lbs. of seed in a traditional feeder. Resealable bag.